Santa always has a blast making toys for good boys and girls. Wondering what's keeping him busy this year? 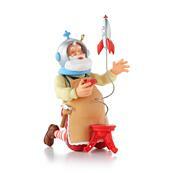 For the 14th ornament in the Toymaker Santa series, the jolly guy is busy crafting a remote control rocket ship. Dated.